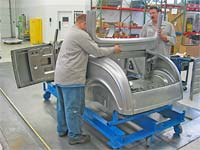 Assembly Shop Tour : Dearborn Deuce, Premier manufacturer of an all steel 1932 roadster body with a fully disappearing convertible top. Close-up view of the precision jigs developed shows how we attach all the outer sheet metal panels. The tolerances are extremely close to ensure that there is repeatability for interchangeability of parts, should the need arise. 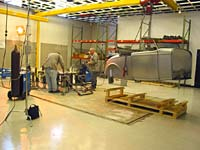 Bodies are assembled in the rear shop and then loaded by crane onto shipping pallets. From here, they are rolled out into the main room where the tops are installed. 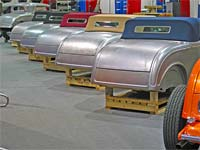 Tops are pre-built on special fixtures in a trim shop, and are waiting for the new bodies as soon as they are “born". 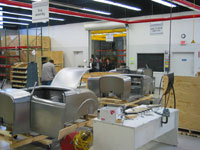 The final assembly area is where all the closure panels get attached after the body itself is built. Here, the tonneau panel is being located. 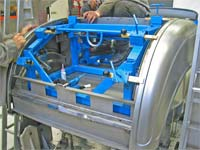 The folding top assemblies and windshields are also mounted here. The end of the line, where the tops, closure panels, and windshields are mounted. When the bodies leave this area, they are finished, and moved off to the staging area. 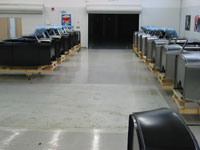 E-coated bodies are lined up on the left, and the non e-coated bodies sit in a separate line on the right. 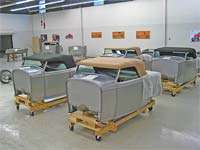 Completed convertible bodies waiting for pick up. With a production rate of one body per day we can provide you with a body shortly after your order is placed. This group of six went to York , PA for a debut of the production bodies.